When I decided to start building a cockpit simulator about two years ago, I knew that I would be able to manufacture parts to replicate a cockpit easily enough because of my background in mechanical engineering, but I knew very little about how to interface my switches and make it all go. 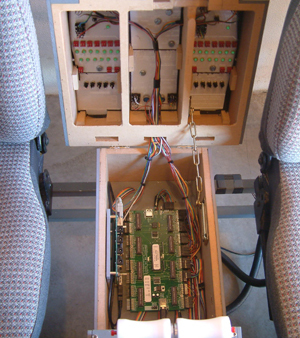 My first idea of modifying a Sidewinder joystick made my sim flyable, but it was limited to the use of 12 buttons. A search for a better solution lead me to IFSBI where I found many helpful members willing to offer advice. I was really surprised to find that there were so many other enthusiasts building simulators and I was not the only one! I joined IFSBI as member #52 and in the short time since I joined, member numbers have grown to over 230. At IFSBI and other similar forums, I tried to research the virtues and limitations of cards like Epic, Hagstrom, X-keys and associated products. The overload of information and terminology way over my head left me even more confused and still unable to choose my interface solution. I'm sure I'm not the only cockpit builder who has arrived at this point! Earlier this year in May, Flightdeck Technology from Crawley in the United Kingdom appeared on the scene. Their "Sim-Boards" were announced as being specifically designed for interfacing flight simulators, the timing for me was perfect and I made the decision to purchase their products after studying the http://www.flightdecktechnology.com website in detail. The support section with the "Show me how" series of articles convinced this tech novice that this was the product to use. I emailed a very helpful Daren Knightsbridge from FDT with a few queries and then sent some Aussie dollars to England. After only 6 days, a slightly crumpled package arrived on my doorstep. Thankfully, the bubble wrapped Sim-Boards and accessories were complete and intact. (A minor complaint here was the high cost of the United Postal Service shipping; it would be good to see a cheaper surface mail alternative from FDT). I had to postpone the Output module that I wanted to buy at the same time but I did appreciate the swift delivery. I ordered the necessary "Master" module and a "64/8/8" Input module as a starter package enabling me to assign 64 switches, 8 Potentiometers and 8 Rotary Encoders, at the time not even knowing what a rotary encoder was! I downloaded and printed all of the "Show Me" files and bound them into a neat manual which turned out to be a good move as it became very handy to have around during the install. It was a tough decision to remove my existing interface solution that had been working well for the previous 6 months but I did so and my sim was out of action for a while. I installed the new Sim-Boards beneath my hinged radio box cover in less than an hour and proceeded to wire my first switch, the park brake. The “Universal Controller” software and driver installed without a hitch and within minutes, I had my park brake working, joy! Success first time, how often do we get to see that with PC stuff? The software has a test function to show you if your switch is wired correctly to a "node", then the assignment is selected from a very clever and simple set of drop down "library" lists. Users of default aircraft, Project Magenta, PM Systems, AST Airbus and Level-D767 are well catered for with a huge amount of available assignments, but unfortunately for me there was no mention of the PMDG 737. Chris Brett, Managing Director of FDT informed me that from his enquiries to the PMDG people that their software is not entirely suited to interacting with software from third party developers. Chris also said that PMDG are planning to rebuild their software for FSX and maybe giving consideration to the needs of cockpit builders and third party developers, we can only hope, fingers crossed! My own independent enquiries to PMDG went unanswered. However, PMDG software does contain quite a few keystroke commands and the Sim-Board software makes it very easy to assign keystrokes to your switches. I spent the rest of the first day mounting and wiring new 10k pots to my throttle levers and 3-axis flight controls and proceeded to span and calibrate the pots. It doesn't really matter how much linear travel or rotation you end up with after you mount your potentiometers, the software easily converts the available travel to 0 - 100% with the ability to reverse the direction. Once wired, my sim was flying again and now with a new novelty - twin throttles and differential brakes, fantastic do-nuts guys! Once assignments are programmed, you save them as a "project" file. The next day when I fired up the sim, I loaded my "project" and encountered my first glitch - my switches and pots didn't work. I could successfully program the switches and pots again from scratch but the saved project although loading ok, wouldn’t work. I emailed Chris and within 24 hours he had emailed me modified software to correct a 'timing error' and the problem was gone, the loaded project worked correctly - great service and support. My second glitch came trying to get my brakes to work. My toe brake switches were assigned to keypress F11 & F12 but the buttons weren't held down and consequently, the brakes wouldn't stay on. I again emailed Chris, his prompt reply informed me that a few users had made the same request for a key repeat function and FDT would be looking into it "in the near future" for a future build of the software. The very next day, I received another email from Chris with a modified version of the Universal Controller software attached which included a 'key repeat' function and found myself with the honor of beta testing the revision for FDT. The modification allows key presses to be repeated with selectable variable timing from 1 to 250 milliseconds, My toe brakes worked and once again I had experienced the outstanding customer service from FDT. The modified software was re-released for all users two weeks later at the FDT website. For the next two weeks, I eagerly spent most of my spare time wiring switches and achieving many new functions. (Thanks to a very patient wife and family!) The conversion of my troublesome ratcheting flap lever switches to a simple pot was a tremendous improvement eliminating all lever position errors. I was also able to reduce the travel of my lever to 90 degrees from 120 degrees which was a little excessive. Next, I installed and wired 8 of the mysterious 'rotary encoders' which also have push button knobs into my radio box. I assigned the push buttons to make the radio panel window toggle on the main screen and the encoders obediently alter the Nav, Comm and ADF standby frequencies. My frequency transfer buttons work and the radio is a joy to use. (The encoders can be assigned to directly alter the active frequencies if desired). I will probably attempt to install 7-segment displays to my radio box when funds and time permit later on. My simulator is working great with its new Sim-Boards, PMDG 737 software and a Matrox triple head video card on a single 3 year old 2.8 GHz PC. Frame rates average around an acceptable 16-18fps with 512mg of ram, (soon to be doubled). look in the FDT forum at IFSBI will confirm this. I have no hesitation in recommending their products to all IFSBI members and readers.